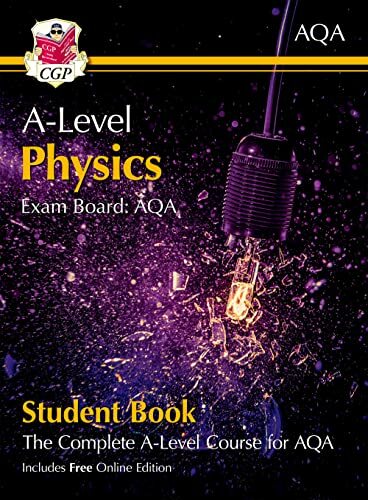 "This unbeatable CGP Student Book covers all of the core content for both years of AQA A-Level Physics - plus the optional topics 9-12. It's brimming with in-depth, accessible notes, clear diagrams, photographs, tips and worked examples. Throughout the book there are lots of practice questions and end of section summaries with exam-style questions (answers at the back). There's detailed guidance on Maths Skills and Practical Skills, as well as indispensable advice for success in the final exams. We've even thrown in a free Online Edition of the whole book - just use the code printed inside the book to access it on your PC, Mac or tablet. If you'd prefer Year 1 (9781782943235) & Year 2 (9781782943280) in separate books, CGP has them too! And for more detailed coverage of the mathematical elements of A-Level Physics, try our Essential Maths Skills book (9781782944713)! "